Review: 2014-10-04, good finish between Max Holloway and Akira Corassani: it gets three stars (UFC Performance of the Night). Max Holloway entered this fight with a pro mma record of 10-3-0 (50% finishing rate) and he is ranked as the No.17 featherweight in the world, he lost twice in 2013, against Dennis Bermudez and Conor McGregor (=McGregor vs Holloway) but he came back to win in 2014 defeating Will Chope (=Holloway vs Chope), Andre Fili (=Holloway vs Fili) and Clay Collard (=Holloway vs Collard). His opponent, the balck belt in tae-kwon-do Akira Corassani, has an official record of 12-4-0 (34% finishing rate) and he entered as the No.34 in the same weight class, he won twice last year, against Robbie Peralta (=Peralta vs Corassani) and Maximo Blanco, but he lost his only bout of 2014 against Dustin Poirier (=Poirier vs Corassani). 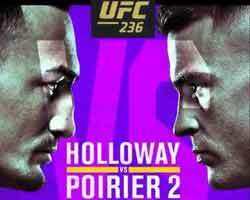 Holloway vs Corassani is on the undercard of Gunnar Nelson vs Rick Story – UFC FN 53. Watch the video and rate this fight!